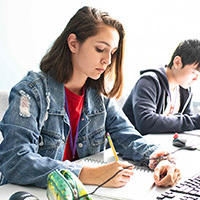 The DigiPen Art and Animation course provides students with an opportunity to develop the skills necessary to pursue post-secondary education in the field of fine art and animation. The program focuses on traditional art skills including basic drawing, composition, line and value, and perspective drawing. Upon learning these skills, students are introduced to essential animation skills like character concept and design, basic keyframe animation, motion studies, and 2D and 3D computer animation. Credit Granted: Students who successfully complete a year of study with the program earn 1.0 fine art credit plus 2.0 occupational education credits. DigiPen college credit available. 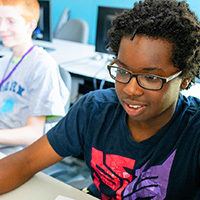 The DigiPen Video Game Programming track gives students an introduction to the art and science behind video game development. 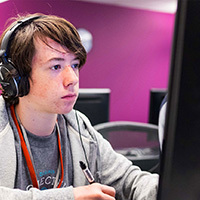 Through seven modules of instruction, students learn key art, math, and computer science concepts that are applied to a game project after each module. While developing their games, students also write a short essay defending the methods and reasons used to complete their project, as well as address industry issues like labor practices, intellectual property rights, publishing contracts and controversial game content. Credit Granted: Students are eligible to receive a College Academic Distribution Requirements (CADR) math credit and may also receive 2.0 occupational education credits. DigiPen college credit available.